If you landed here after Googling "freeware code snippet manager" for the past couple of hours, you are probably just as disappointed as I was one weekend before I decided to write this software that I call "Snippet Manager". Snippet Manager is an extremely lightweight (no setup required) freeware utility that you can use for managing your code snippets in a variety of languages. Snippet Manager works with VB, C++, C#, Java, SQL, ASP, PHP, HTML, even COBOL, Assembler and Fortran (37 languages are supported). You can also use Snippet Manager to manage plain old ASCII text data. Snippet Manager features a powerful search tool that is geared towards developers. You can use regular expressions or simple search criteria to find the exact code you need, when you need it, based on the language, category, dependencies, keywords or the actual code that you are looking for. Another useful feature is the ability to publish your snippets on the Internet and optionally password protect your code. All you need is an FTP server to host snippets for your company or for anonymous users over the Internet (your choice). Best of all, Snippet Manager is secure. The software does not "phone home" for any reason. You are virtually guaranteed that the software will never quit working or that your source code will ever be distributed without your permission. No setup required. Simply download the ZIP file and unzip the files into the directory of your choice. To launch the application, double click SnippetManager.exe (Microsoft .NET 3.5 framework is required). Tip: Run Snippet Manager from a thumbdrive and take your code snippets with you wherever you go. Simply click the "New Snippet" button on the left side of the toolbar. Select the programming language that you wish to use then click OK.
Now you can cut and paste your code or type new code into the Code Window. If your code uses any dependencies (includes, uses, imports, etc. ), please move those into the "Dependencies" text box on the bottom left. 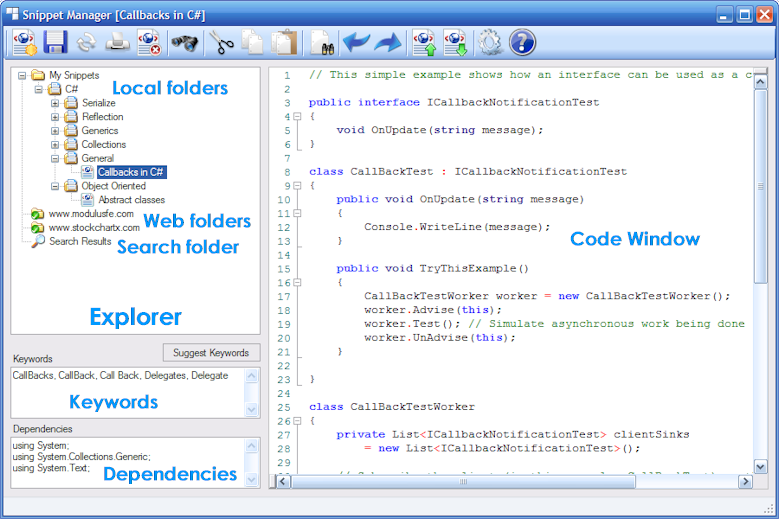 This is so that the search tool can easily find your code based on the type of dependencies it uses. Now simply type some keywords into the Keyword text box. Make sure to include everything possible. For example, if you are saving a snippet for serializable objects, make sure to include serialize, serializable, serialized, serializing, serialization, etc. You can also use the "Suggest Keywords" button. Tip: You can edit the "stop words" for the "Suggest Keywords" feature by editing the StopWords.txt file located in the SyntaxFiles directory. For information on what a "stop word" is, check it out on wiki. Basically, they are words that should be ignored when suggesting keywords. Save the snippet to give it a name and assign it to a category. You can select a category or type a new one. Note that you can only save a new snippet to the local "My Snippets" folder. Your snippet will be saved in an XML file in the Snippets directory. Note that if you make changes to a snippet located in a web directory and then you save it, those changes will be overwritten if you download that snippet again from the web server. In order to save the snippet to a public FTP directory, use the Upload button. FTP servers are set in the Settings window. Click the Search button to search for snippets based on keywords, snippet names, language, category or actual source code. By default the search feature will search all folders including "My Snippets" folder and any other snippet folders that have been downloaded from the web. This can be changed by selecting the "Search only My Snippets" checkbox on the search window. Click the Search button to run a search. Results will display in the "Search Results" node on the Explorer. You can download snippets from HTTP servers by adding the URLs in the HTTP server area on the settings dialog. Add your username and password if your HTTP server is protected, otherwise leave these fields blank. If you select the "Subscribe" check box, Snippet Manager will check the HTTP server for new snippet updates each time the application starts up. A purple icon will display next to a web folder whenever updates are available . Simply click the Download Snippets button to update. Note: usernames and passwords are encrypted before being saved on your hard drive. Click the Download Snippets button on the toolbar to download snippets that have been entered in the Settings dialog. Folders that have successfully downloaded will display a green icon . If you want to upload snippets from in your "My Snippets" folder to a public FTP server, just add your FTP servers in the Settings dialog, along with your FTP username and password. Make sure to set your port number (usually 21), select if you are using Passive Mode and Keep Alive, then enter the categories that you would like to upload to your FTP server. Only snippets located in those specific categories will be uploaded to the FTP server. Note: again, usernames and passwords are encrypted before being saved on your hard drive. Note: When saving snippets to a web directory, that directory MUST exist on the FTP server prior to clicking the Upload Snippets button, because Snippet Manager will not create the directory for you. You can use Snippet Manager as a stand-alone application or you can link it to your programming IDE. To link Snippet Manager with Visual Studio, select "Tools" from Visual Studio, then select "External Tools..." Next, select SnippetManager.exe and click OK. You can now launch Snippet Manager from the Tools menu in Visual Studio. If you would like to contribute your code snippets, simply post a link at http://blog.snippetmanager.net. Make sure to let me know if you would like your snippets to be included with the installation. Otherwise you can host your own snippet server and provide a link in the blog comments.